Baseballs were flying around the park at Brewster on Wednesday. Brewster led Cotuit early on scoring two in the first on a Conor Grammes two-run home run. The Kettleers came back with a lead off home run from Michael Salvatore in the second and a Michael Toglia home run in the fourth to tie things up. Back to back homers for Brewster in the fifth from Gage Workman and Ike Freeman gave the Whitecaps the lead again, but Cotuit answered with four in the sixth. After a few RBI singles from Duke Ellis and Peyton Burdick, Adam Oviedo hit a single to left to score two, which proved to be the game winning hit. The Red Sox grabbed the 1-0 lead after one inning after Quin Cotton drew a bases loaded walk to score Jonathan Deluca. Orleans worked two runners on early in the second inning and cashed them in with a three-run shot from Kenyon Yovan to claim the lead. The Firebirds were pretty much shut out from that point on, and the Red Sox were able to put up six runs in the fourth inning which included a two-run bomb from Zach Zubia and a double to center field that scored two off the vat of Noah Campbell. Y-D crossed one more in the sixth, and Orleans’ JJ Bleday hit a solo homer in the seventh, but that ended the scoring for the ball game. It was a real low scoring affair in Bourne on Wednesday between the Hawks and Braves. Matthew Barefoot drove in the Harbor Hawks only run in the third inning on a single to score Braden Comeaux. In the seventh, Bourne’s Jake Garella tied the game up with a double that scored Ashton Bardzell. Both teams went cold, and the game was forced to extras. After no runs in the tenth, the Braves walked it off in fashion in the eleventh after Garella drove in his second run of the game on a single to score Spencer Brickhouse. Wareham crossed the first run of the game in the third inning on a two-out triple from Isaac Collins that scored Skyler Hunter to take the 1-0 lead. Falmouth got that run back in the fourth with a Cameron Cannon RBI single, driving in Davis Sims and tying the ball game. Falmouth, however, was shutdown, collecting only six hits and crossing that single run in the fourth inning. The Gatemen could not get anything going in the middle innings, but came alive again the latter part of the game, scoring a run on a Hunter single in the seventh, and a run scoring double from Gian Martellini. Chatham took the lead in the third inning, using an error by Harwich’s second basemen, allowing Greg Jones to score. Harwich then tied, then took the lead in the fifth when they also took advantage of an error by Chatham’s shortstop, allowing Ben Norman and Jordan Greene to score. In the sixth, the Anglers blew up for five runs on two solo shots from Colin Simpson and John McMillon, an error, a single to left field from John Rave to score a run, and a balk. This gave Chatham a 6-2 lead heading into the seventh inning. The Mariners were able to score one more on a groundout that scored Andre Lipcius, but that is all Harwich had in the tank. Bourne’s huge sixth and seventh inning rallies pushed them passed the Kettleers on Thursday evening. 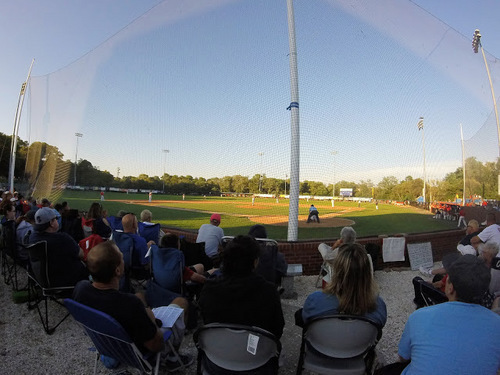 After Cotuit broke the 0-0 tie in the fifth on a single to right field from Zachary Biermann that scored a run, the Braves put up three runs in the sixth. Tyler Fitzgerald doubled to tie it up, and later scored on a Jared Triolo triple. Triolo then scored on a pass ball, giving the Braves a 3-1 lead. Cotuit cut the score to 3-2 after a Cory Wood solo home run in the bottom half of the inning. Bourne then scored four in the seventh after Danny DiGeorgia singled to right and scored two runs. DiGeorgia later walked home after Triolo worked a bases loaded walk. Fitzgerald also scored on a fielder’s choice to make it 7-2. Cotuit scored one in the bottom of the inning with a single from Jonathan Robertson. The Kettleers showed fight, scoring two in the ninth on a two-run shot from Peyton Burdick, but the rally fell short. Falmouth drove in two runs to start the game after a Kyle Stowers sacrifice fly and an errant throw to third from the catcher that allowed Maverick Handley steal third and walk home to make it 2-0. Jeremy Ydens doubled in Isaac Collins for the Gatemen to put them on the board. Wareham then took the lead in the second after a Ryan Kreidler single to shortstop scored a run, then a sacrifice fly to center from Jakob Goldfarb to score Oliver Dunn. The Commodores tied it up in the third when Stowers scored on a Cameron Cannon single. After three scoreless innings from both clubs, Cannon struck again in the seventh with a two-run single to take the 5-3 lead. Falmouth’s pitching did their job shutting down the Gatemen after the first two innings, allowing the three runs on eight hits.